Since 1984, Peter Gulia has focused on the design, governance, fiduciary investment procedures, and administration of retirement plans. Peter Gulia is in Thomson Reuters’ Super Lawyers for 2015-2018. Peter is widely published on fiduciary duties and procedures, retirement plan investments, beneficiary designations, and domestic-relations orders. Peter has for 24 years published with Wolters Kluwer Law & Business. He is a contributing author of six books in its Answer Book series, and of ERISA: A Comprehensive Guide. Peter is a Contributing Editor of 401(k) Advisor. Peter is an author of Adviser’s Guide to Retirement Plans for Small Businesses (AICPA), including that book’s chapter on fiduciary duties. Peter is a Bloomberg BNA Insights author and CLE speaker. Peter Gulia is an adjunct professor in the Graduate Tax (LL.M.) 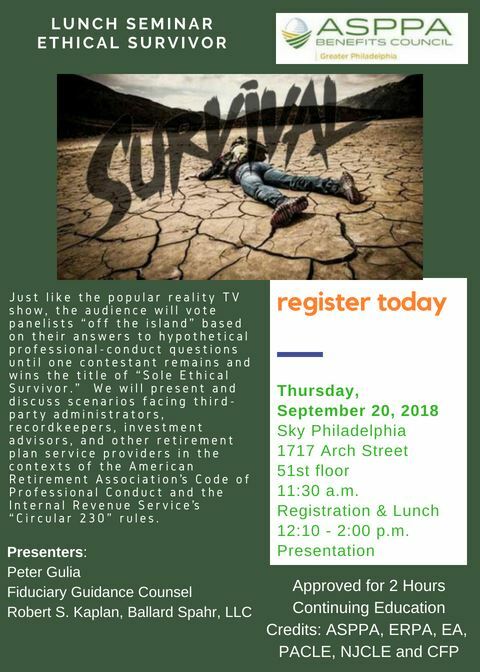 Program of Temple University’s Beasley School of Law, teaching its ERISA Fiduciary Responsibility course and its Professional Conduct in Tax Practice course, speaking in its employee-benefits public policy course, and supporting other tax and employee-benefits instruction. Peter has taught and teaches a range of professional-education programs for the American College of Financial Services, American Law Institute, American Society of Pension Professionals and Actuaries, Federal Bar Association, Fi360, National Association of Personal Financial Advisors, Pennsylvania Bar Institute, Philadelphia Bar Association, and several States’ and cities’ associations for lawyers, actuaries, accountants, human-resources officers, and financial officers. Robert S. Kaplan advises corporate, nonprofit, and governmental employers on issues related to the design, drafting, implementation, and termination of retirement and health and wellness benefits plans. Rob regularly works with our mergers and acquisitions and securities attorneys to analyze employee benefits and executive compensation components of corporate transactions. Rob frequently works on the correction of plan defects under Department of Labor and Internal Revenue Service procedures and counsels plan fiduciaries and benefits committees on their fiduciary obligations. He also works with third-party administrators on their obligations with regards to plan administration. Rob has conducted investigations for ERISA Fiduciary Violations, and reviewed and processed Voluntary Fiduciary Compliance Program (VFCP) applications by plan fiduciaries to correct prohibited transactions for the U.S. Department of Labor’s Employee Benefits Security Administration. Prior to joining Ballard Spahr, Rob worked for Bank of America Merrill Lynch as a Senior Compliance Consultant and Prototype Document Manager. Rob was principal drafter of a proprietary prototype document and related amendments, Summary Plan Descriptions, and Summary of Material Modifications, and provided compliance consulting to plan sponsors and fiduciaries on plan design and operations. He also formerly served as an ERISA Consultant with Ascensus Retirement Services.